Summary: Planning to use his summer to save up for a trip to Europe, Steve finds the death of his grandfather, David McLean, gets him there a lot quicker when the will leaves him an airplane ticket and a mystery to solve in Spain. Tracking down his grandfather’s lost possessions leads him to Laia, the great-granddaughter of Maria, and an old journal detailing McLean’s twelve weeks as a soldier in the International Brigade struggling to protect Spain from the Fascists. As Steve and Laia make their way through the journal and Spain, Steve connects with his family history by following in his grandfather’s footsteps and the experience leaves him with a completely different perspective of the man he thought he knew. 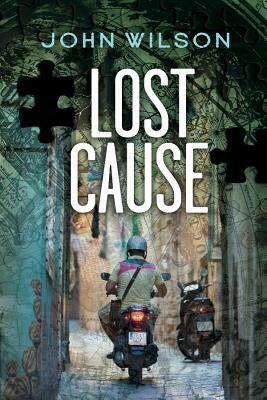 Review: Lost Cause by John Wilson was my last Seven the Series read. I know they are meant to be read in any order, but I particularly liked having Steve’s story as my last book because it was unique. Each grandson is in a different stages of growing up. McLean seems to be aware of this from the grave as he picks out a specific mission for each one, guiding them into adulthood and fostering self confidence and self esteem when necessary. But Steve is different. He and his grandfather weren’t close, and it wasn’t because they didn’t know each other. The younger twin of DJ, Steve is often overlooked in his own right and DJ has assumed a role of responsibility as surrogate parent after the death of their own father. The ridiculousness of DJ acting more mature than Steve is not lost on him, and as a result their relationship is somewhat strained. The task Steve receives from his grandfather is to go to Spain and retrieve some items of his that he left behind after serving in the International Brigade. Because it means he gets to go to Europe as he always dreamed of doing, Steve is ecstatic. He isn’t daunted by the fact that his grandfather’s instructions are kind of sketchy and unclear, but jumps into the experience to learn what he can and figure out what his grandfather was doing in Spain in the first place. What he finds with Laia as his guide is a rich history of McLean’s first experience abroad. Jumping into a war he didn’t really understand, and having to come to terms with the reality of that action. McLean’s journal is powerfully written, detailing the initial arrogance of a young man with strong beliefs and without the experience to back them up to a sorrowful, pensive man tempered by war. As with all Wilson’s books, I learned a lot. This time I learned about the Spanish Civil War in the 1930s. Wilson opened my eyes to the folly of other countries in their lack of involvement, although one might argue there was no way of knowing it was a stepping stone to World War II, but he also skillfully showed that as in all wars, it is never a black and white situation. By the end of the book, I wondered if, of all of the grandsons, Steve is the embodiment of his grandfather. His story is all about retracing his grandfather’s steps, living through his grandfather’s words, and making the choices his grandfather perhaps should have made. If you ignore the fact that McLean’s decisions meant Steve was born, then Steve’s story feels like a righting of wrongs – like the life McLean should have had after the war. For me, it was an immensely satisfying conclusion to Seven the Series, and I am very happy Seven the Sequels are waiting for me read having been published in 2014. ‘My grandfather’s past,’ I said. Lost Cause by John Wilson is published by Orca Book Publishers, (2012).